Treasures are found buried underground – that’s why, in this charming cellar, there are over 300 bottles here of the finest wines from within and without Italy’s borders. Seriously, if wine tasting is your thing, then the staff here will go out of its way trying to make your experience a good one. You can even book a group or event-oriented wine tasting menu. How popular is Enoteca Cava Turacciolo? People normally club together Lido Di Bellagio and Aperitivo Et Al Bar while planning their visit to Enoteca Cava Turacciolo. It was lovely, great food and extensive selection of wines. Amazing wine, food and very friendly service. This a cool little spot up an alley near the ferry terminal. There is a table with 2 seats outside and another 10 or so small tables inside. If you feel like wine and charcuterie, go here. Simple, yet spectacular food. 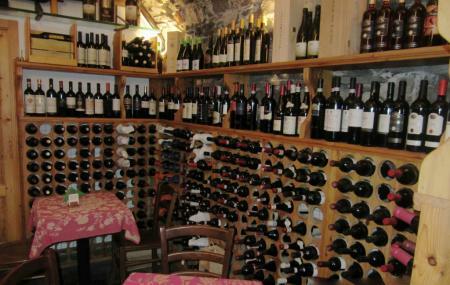 The simplicity of the food selection is complemented by a rather large wine menu. The staff were extremely friendly. Reasonable prices.